In bulletin #69 the Masked Booby image, with the 2X, was made at f/11, rather than f/8. This is a departure from shooting wide open? Why so? First of all, with the bird's bill angled towards me, I knew that the additional depth-of-field would help keep the entire bill sharp. It did. Secondly, whenever I have sufficient shutter speed (1/125th sec or more with a big IS lens), I always try to use f/11 with the 2XII converter because this combination is allegedly sharper at f/11 than it is wide open (at f/8). But do note that I and others have made many sharp images with both the 500 and 600 IS lenses at f/8. Bulletin subscriber Sandy Selesky was confused by my comments on exposure. I finally realized that I should have written, "in full sun, this would have been a -1/3 compensation." To clarify: in the soft, early morning light, I used the metered (evaluative) exposure. The ocean was a soft blue and I knew that I did not have to worry about burning (overexposing) the whites (because of the soft light). In full sun, however, the ocean would have been a much deeper blue and without subtracting some light from the metered exposure, the whites would surely have been overexposed. 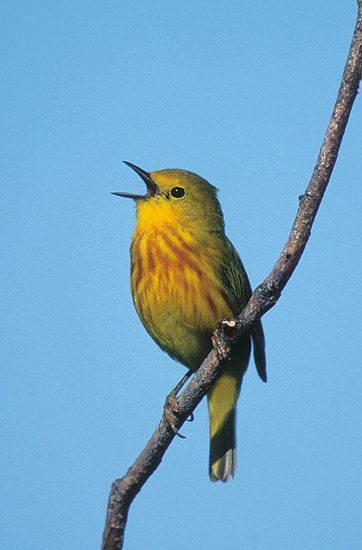 Yellow Warbler/singing male. Churchill, Manitoba. Canon EF 600mm f/4 L IS lens, 2X II TC, EOS 1v. Evaluative metering +1/3 stop: 1/500 sec. at f/8. Here, I made the image wide open (at f/8) to ensure maximum shutter speed and thus, a sharp bill on the singing bird. The Art Of Nature Photography: It Ain’t Just Birds! 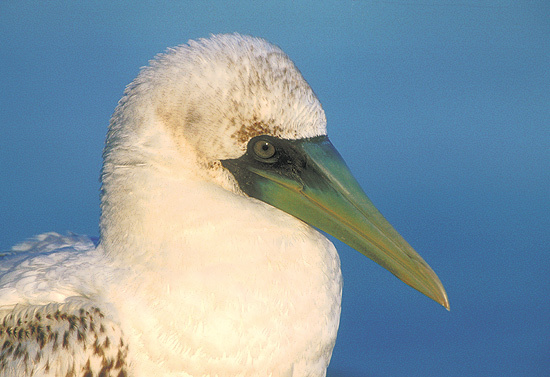 On Saturday, August 31, 2002, internationally renowned bird photographer Arthur Morris will present a full day Seminar--The Art of Nature Photography; It Ain’t Just Birds!, in Boston, Massachusetts. More than 10,000 of Mr. Morris' technically perfect, artistically designed images have appeared in virtually all natural history, photography, and birding publications, as well as in many general interest publications and advertisements, and on posters, prestigious calendars, and web sites. Arthur has been a Canon contract photographer since 1995, has done a worldwide television commercial for the EOS 1N, and has appeared in eight episodes of the Canon Photo Safari television program. He is a contributing photographer with VIREO (Philadelphia), Visuals Unlimited (NH), Windrush Photos (UK), and The Corbis Stock Market, (New York). He has written or been featured in more than 150 magazine articles, and has written four books; the latest, The Art of Bird Photography is considered the classic how-to work on bird photography. Artie is an Outdoor Photographer columnist. This seminar is for all nature photographers (not just bird photographers) who want to learn how to make better images. Artie will describe the methods and techniques that he has used and developed used since 1983. His comments on equipment, film, autofocus, light, exposure, composition and picture design, image sharpness, getting close to wild subjects, and his tips on photographing action and behavior will benefit everyone with a telephoto lens who wishes to dramatically improve the quality of their images. 1. All about modern autofocus cameras and lenses as well as the pros and cons of both the Canon and Nikon systems. The cost of the How-To Seminar (9am - 4:30 pm) is $65.00 ($55.00 for Boston Camera Club members). Those wishing to help publicize these events may of course reproduce this information elsewhere in any form. The In-The-Field Workshop will surely sell out almost immediately, so please register early if you wish to attend; a waiting list will be maintained. Please open the attached PDF file to register. Bulletin subscribers who register for this Seminar are asked to please let us know by e-mail. Thanks! 9:00 AM TILL 4:30 PM DOORS OPEN AT 8 a.m.
A selection of books, prints, and photographic accessories will be available on Saturday. Seminar and In-The-Field Workshop registration confirmations (that will include locations and directions) will be sent to all registrants upon receipt of payment. Cancellation Policies: Seminar-only registrants canceling before August 1, 2002 shall receive a full refund less a $10.00 processing fee. Seminar/I-T-F Workshop registrants canceling before July 1,2002 shall receive a full refund less a $30 processing fee. Those canceling between July 1 and July 31, 2002 shall receive a full refund less a $30 processing fee only if we are able to fill their slot in the I-T-F Workshop.